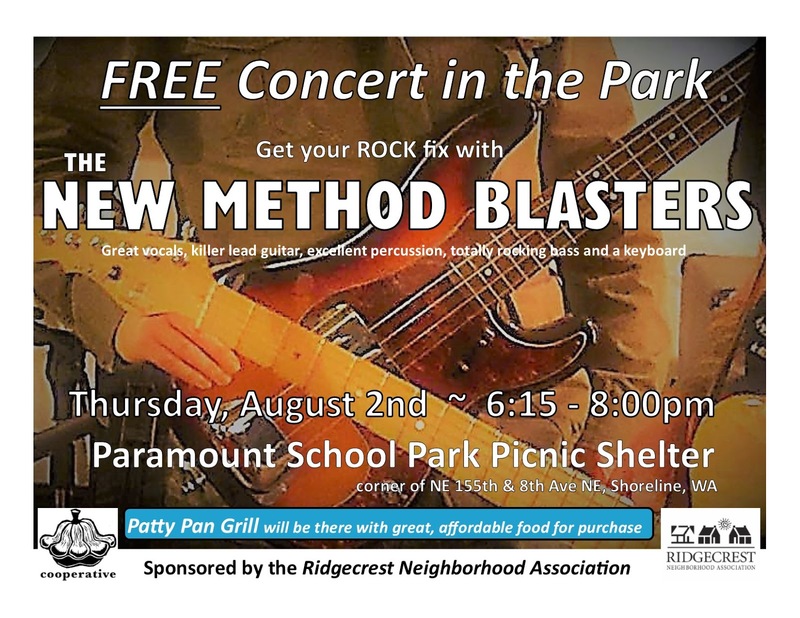 FREE Concert in the Park with the New Method Blasters on Thursday, August 2nd, 6:15 – 8:00pm, at the Paramount School Park picnic shelter, corner of NE 155th and 8th Ave NE, Shoreline 98155. The New Method Blasters play Rock! Great vocals, killer lead guitar, excellent percussion, totally rocking bass and a keyboard. Join your friends and neighbors at this family friendly event for a fun evening in the park. Bring a blanket or your concert chairs. Patty Pan Grill Food Truck will be there with food for purchase. Sponsored by the Ridgecrest Neighborhood Association.